I should probably preface my review of THE ERA OF NOT QUITE by Douglas Watson by telling you that I "know" the author. He is a close friend of my brother-in-law's and I've met him a few times over the years, but I really wouldn't call him a friend -- more of an acquaintance. At a party a little over a year ago, he told me that his first book was being published, and (the book geek that I am) I mentioned that I'd love to read it. 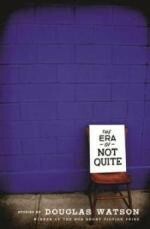 A few months ago, Doug emailed me asking if I'd take a look at his book THE ERA OF NOT QUITE. He described it as "vaguely absurdist, death-haunted short stories." Of course, I jumped at the chance but I admit that I was a little concerned that this book was outside of my normal reading fare. I remember him telling me that this book isn't for everyone, and I was under no commitment to read it, review it, or even like it! So it was with a little excitement and a little trepidation that I picked up THE ERA OF NOT QUITE. THE ERA OF NOT QUITE is a collection of truly original short stories that deal with a little bit of everything -- life, death, and love. But it's also about the living -- both the ups and the downs, the good and the bad. I realize this description sounds pretty vague, but it is difficult to summarize this book in just a few sentences. I will just say that this small book covers a lot... and packs a powerful punch. THE ERA OF NOT QUITE also has some unique characters who experience some extremely unique situations. I'm not going to lie to you -- this book is a little bit weird! It is unlike any collection of short stories (or books for that matter) that I've ever read. But I absolutely adored THE ERA OF NOT QUITE -- and it has absolutely nothing to do with "knowing" the author. These stories were entertaining and often times surprising, and I actually found that I couldn't put the book down because I couldn't wait to see what was around the next corner. There is no doubt that Doug Watson has some mad writing skills. THE ERA OF NOT QUITE has already won the BOA Short Fiction Prize and a few of the stories have appeared in Tin House (online), Sou'Wester, and Fifty-Two Stories. But he also has a slightly twisted mind and that's evident in the originality and brilliance of these stories. In fact, THE ERA OF NOT QUITE is so smart and witty that I actually scratched my head that one individual could create them. However, I think what impressed me the most about this book is just how "different" each story felt. Of course, there are recurring themes throughout many of the stories gave the book a feeling of continuity, but each story almost seemed as if it could have been written by a different writer. Some were almost like fables, while others were dark and depressing, and others were almost whimsical. THE ERA OF NOT QUITE is truly a special and extremely well written book! If you are looking for something a little different than what you ordinarily read, that's smart and funny and insightful, then I highly recommend reading THE ERA OF NOT QUITE. I think it is refreshing when you find a book that is just a few steps off the beaten path. There are way too many of them that are just forgettable. Wow, this sounds very interesting. I love books that make me think.